The good news? The latest versions of browsers can help you solve this problem by using source map. 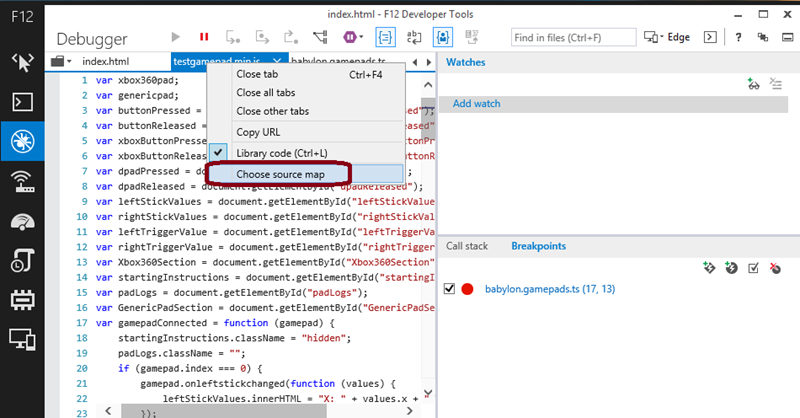 In this tutorial, I’ll show you how to find Source Maps in all of the browsers and get the most out of those few minutes you have to debug. Wait, What are Source Maps? 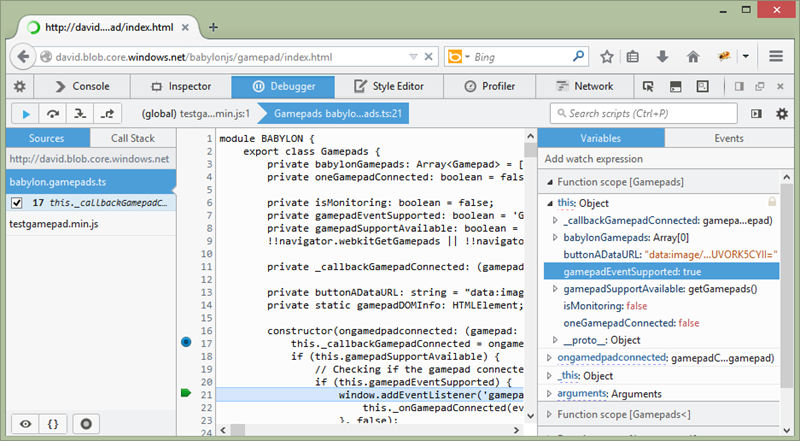 Internet Explorer 11 , August update (version 11.0.9600.17239) or even better, the developer channel version: devchannel.modern.ie supporting the Gamepad API. A sidenote on IE: Microsoft is working on a new browser Microsoft Edge so be sure to check latest web standards support for it: status.modern.IE. 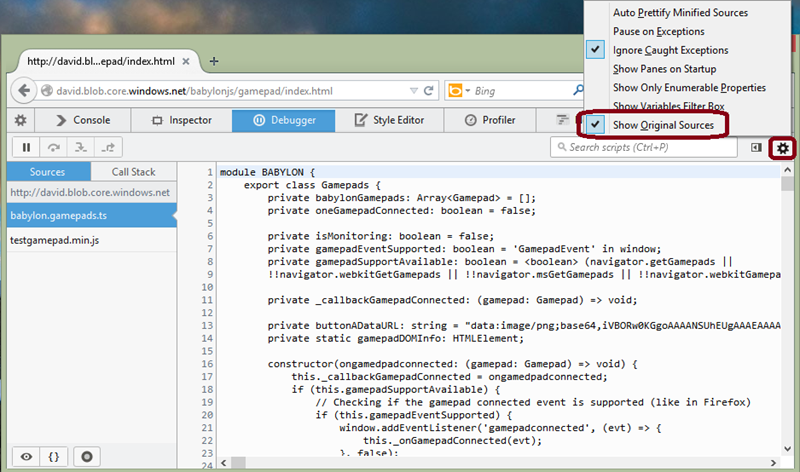 You’ll see that IE11 offers two files to debug: babylon.gamepads.ts and testgamepad.min.js. Let’s start by reviewing the babylon.gamepads.ts case. Why does IE show it instead of the .js version being executed by the browser? 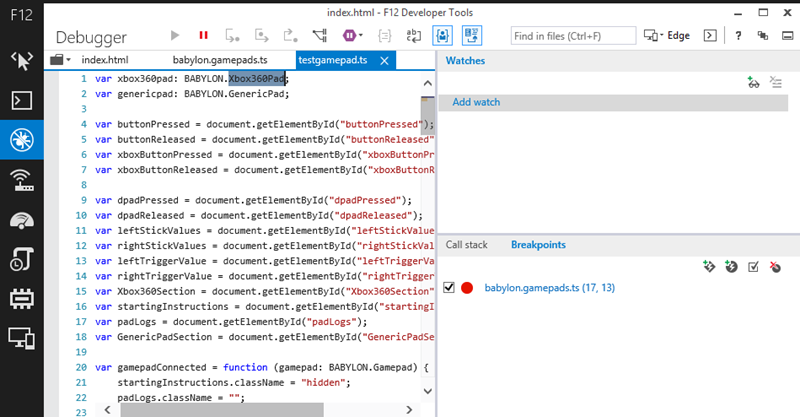 By reading this JSON file, IE11 knows it should map babylon.gamepads.ts to babylon.gamepads.js. 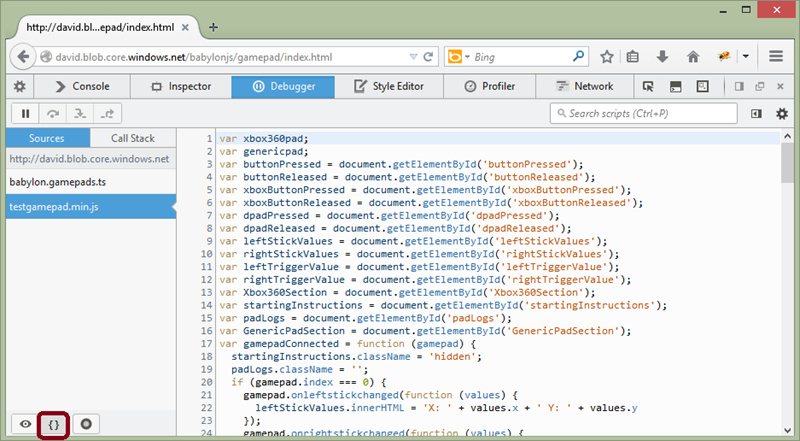 That’s why, it directly offers you to debug the TypeScript source instead of the compiled JS version. 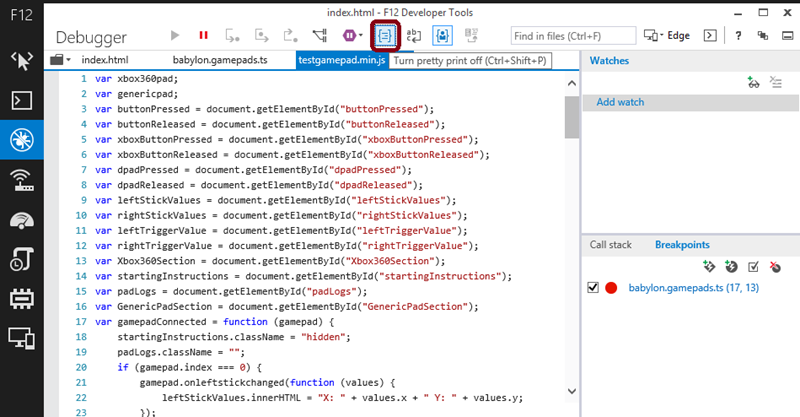 Load the same page and press CTRL+SHIFT+S to open the native debugger (don’t use F12/Firebug, it doesn’t support source map). Set a breakpoint as usual on the line 17 and reload the page to break into the code. Firefox doesn’t support mouse hovering on the original source. 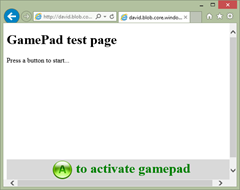 Step up to line 20 and expand the this object instead in the right panel to check that gamepadEventSupported is set to true also. Imagine you’d like to avoid anyone else debugging the production code of your web app using source map, but you still want to be able to do so? 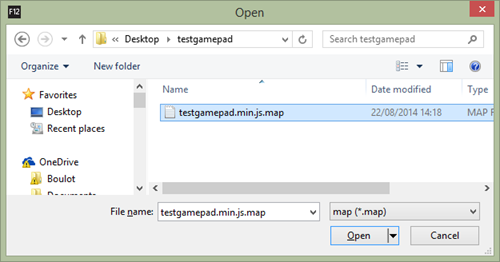 Just remove the sourceMappingURL line from your .js file. 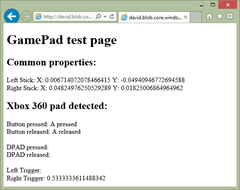 Notice that the tab has been renamed to testgamepad.ts and that the first variables are now typed as we’re displaying some TypeScript. 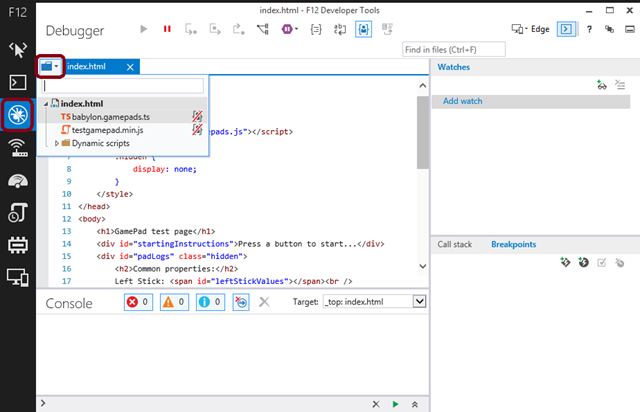 This article is part of the web dev tech series from Microsoft. We’re excited to share Microsoft Edge and its new rendering engine with you. Get free virtual machines or test remotely on your Mac, iOS, Android, or Windows device at modern.IE. I read your blog it's really nice and i like it very much.Thanks for sharing this useful information.